We’ve already known that the Nook Color’s chipset contained Bluetooth capabilities though these are disabled on the stock software. If you’ve gone ahead and rooted your device you are already discovering the large number of hidden possibilities of the Nook Color but also the frustrations of some of the hardware limitations. Having Bluetooth connectivity means that you can by-pass some of these limitations and also extend the usefulness of the device, i.e. connect a Bluetooth headset for Skype calls or voice recording, a speaker for audio output, connect a keyboard for quick typing or even GPS devices and Bluetooth game controllers. Download the SD card image. Unzip the image on your computer. Insert a microSD card (4GB and above) into an SD card reader on your computer. Burn/restore the image on your SD card. If you are running Windows, download and install WinImage, then select ‘Disk’ and ‘Restore Virtual Hard Disk Image on physical drive’; choose your SD card, then browse you computer (making sure you select ‘all files’ at the bottom-right) and select the image you saved above. The process can take a while to complete. 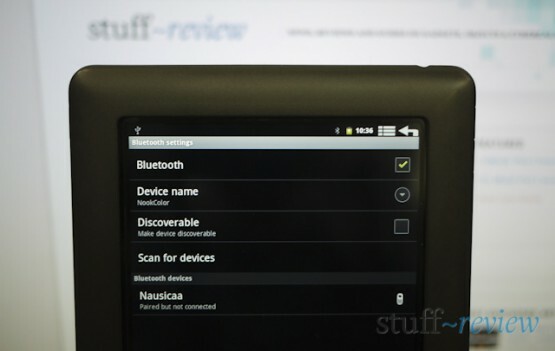 Turn off your Nook Color and insert the microSD card you’ve created. It should boot directly into CM7 – as mentioned no changes are made to your device. Now simply go to ‘Settings’, ‘Wireless & network settings’ and enable Bluetooth. We can confirm that we have successfully connected a Motorolla Bluetooth speakerphone and a Logitech keyboard to the device but haven’t used them with any applications, however we are pretty excited with the possibilities this ‘hack’ brings. You can find more information in the xda-developers forum thread below, and please let us know of your experiences. Specifically, download the file ‘gapps-gb-20110120-signed.zip’ from any of the three sources at the top, then unzip it in the adb directory. Now you have to use command prompt; click on the Windows button and type cmd. Change your directory to the one containing adb by typing cd c:/'directory path here' and replacing the ‘directory path’ with your adb directory. Now copy, paste and press enter for each of the commands one-by-one from adb remount to adb reboot. Hopefully now you will have access to the Android Market so that you can test drive bluetooth with different applications.